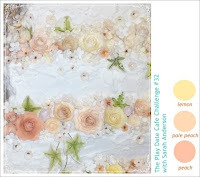 Welcome to another wonderful Color Challenge from The Play Date Cafe! This week we have Limelight Papercrafts as our sponsor, and Jen del Muro joining us as a Guest Designer. Be sure to play along this week for your chance to win a fabulous prize donated by Limelight Papercrafts! Sarah provided a beautiful inspiration photo (see below) for this weeks challenge. I used it as the perfect opportunity to combine papers from Basic Grey's Cappella and Two Scoops paper lines. 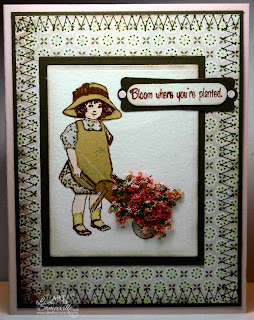 The cute vintage image is from the new Bloom and Grow plate by Artistic Outpost. The image is stamped in Sepia on Watercolor paper, then paper pieced with the Basic Grey papers. I added a bit of coloring and Flower Soft to the wheelbarrow for some added dimension. The background panel is from the Basic Grey Cappella line, I added some stitching in Soft Suede using the Stitching Stamps from Starving Artistamps. Here's this weeks Color Story Photo: Lemon, Pale Peach and Peach. We'd love for you to play along with this weeks challenge at The Play Date Cafe, you can find all the details here on how to enter. Just adorable, luv the added stiching...and the paper! Love this sweet image and how you paired up with the lovely paper. Lisa, She is so adorable! Love how you used flower soft, which I need to attempt! Great as always! This is simply beautiful, Lisa! That image is just darling and I love your use of Flower Soft!! Such a cute card Lisa! I LOVE your stitching, it's FAB! The flower soft looks great here too! 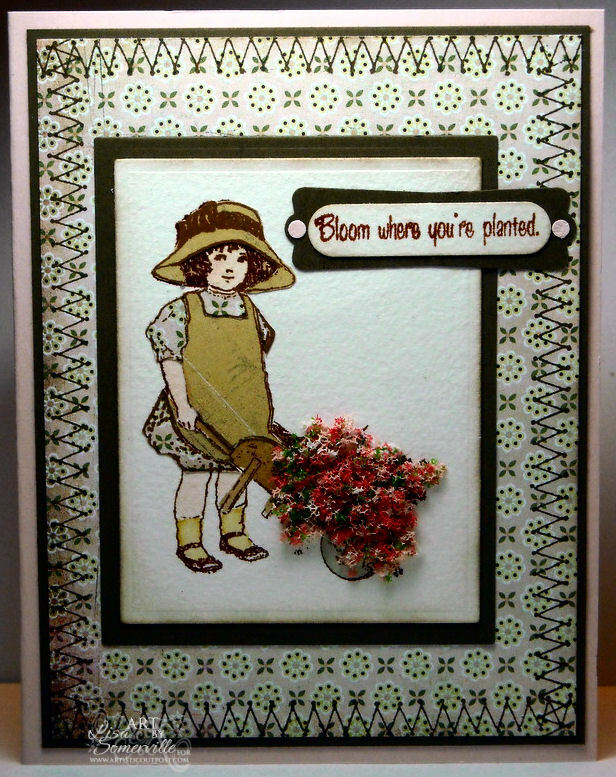 Cute, love the paper pieced dress, the stitching and the flower soft you added are a great finish to the card.